Here’s another image from my trip to ANWR in 2006. This particular afternoon was early in the trip, and we hiked up around some ridgelines, not far from the Upper Marsh Fork river. It was an awesome afternoon, and we spent several hours clambering around the hillsides. The wind picked up pretty strongly, after a while. I had carried a tiny little gitzo tripod with me, and it really wasn’t up to the task of holding up my camera gear in wind this strong. So I kept hiking around, exploring the high mountain ridges and enjoying the view. I also enjoyed the lack of mosquitoes, due to the high winds. Eventually, a few breaks in the wind alowed me to take a few photos of the area. I then hiked a nice loop east of the river, up a broad unnamed valley, over a couple of ridges towards the south, and finally made my way back towards the Upper Marsh Fork river again. The beauty of hiking in such open terrain is, to me, just being able to get out and walk where you want to, with little regard to anything other than the moment. It’s an awesome treat. ANWR is such a diverse area, it has an incredible variety of landforms and terrains. The Brooks Range is a rugged mountain chain, running east – west across the northern edge of the continent, reaching into Canada’s Yukon Territory in the east and Alaska in the west. The mountains are not especially high, but are significant in that they form the continents’ northern most drainage divide. The northern watershed runs into the Arctic Ocean, and the watershed to the south drains into the northern Pacific. 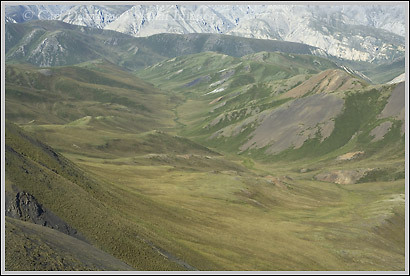 The Brooks Range, and ANWR in general, is one of the most remote wilderness areas in North America, and critical habitat for a variety of wildlife. While in the area, we saw, or saw sign of, caribou, dall sheep, grizzly bears, wolves, wolverine, red fox, arctic fox, lynx, moose, muskrat, golden eagle, gyrfalcon, northern rough legged hawks, snow owls, boreal owls, tundra swans, and a host of other birds. I’ll post a few more landscapes in the next few days, then maybe start some of the wildlife images I took up there. This entry was posted in Adventures, Alaska, ANWR, Backpacking and Hiking, Landscapes on May 9, 2007 by Carl D.
What an unbelievable view. I could just sit here for hours – no make that days. Thanks again – it’s really is an unbelievable view .. and I DID sit there for hours .. 2 hours, in fact. 2 killer hours.